The Border Terrier was developed in the hills between the north of England and the south of Scotland. The breed’s character and shape evolved from its use with Foxhound packs and by the shepherds to guard the sheep and lambs against foxes. It was important that the hunt terrier got on well with the hounds and other terriers and had enough sense to keep out of trouble with the pack and the horses. Contrary to popular belief, Border Terriers did not run with the hounds, but followed the horses and had to be prepared to go to ground and keep the fox at bay for as long as was necessary. These courageous dogs usually live up 14 years, but with good care and attention and a sound diet Border Terriers can live up to 16 years of age. This animal is usually up to 6.4kg for the female and 30cm tall, while the male is 7kg and grows to 37cm tall. There is nothing small about the Border Terrier except its physical size – it is essentially a big dog in a little dog’s frame. By nature these dogs are well behaved and reasonably prepared to do the right thing. However, they do not have the instant response to command like a gun dog or Border Collie, preferring to do things in their own time! They are sensitive and companionable by nature but not overly demonstrative, liking to keep near their owner or at least keep a close eye on what is going on. Most Border Terriers are good with children, but, as with all dogs, children must be taught to respect their pet, particularly when it is sleeping or eating. Border Terriers are generally good with other breeds of dog, but need to be brought up with cats and other pets. 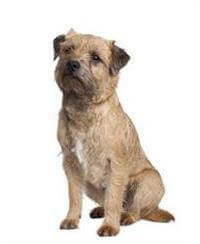 Border Terriers have a rough double coat that needs to be stripped free of dead hair about twice a year. Most pet owners can easily do this. Brushing with a good stiff brush is recommended, along with bathing as required. Although Border Terriers will rarely start a fight, they will not back off in a confrontation. Families with older children and active older people.